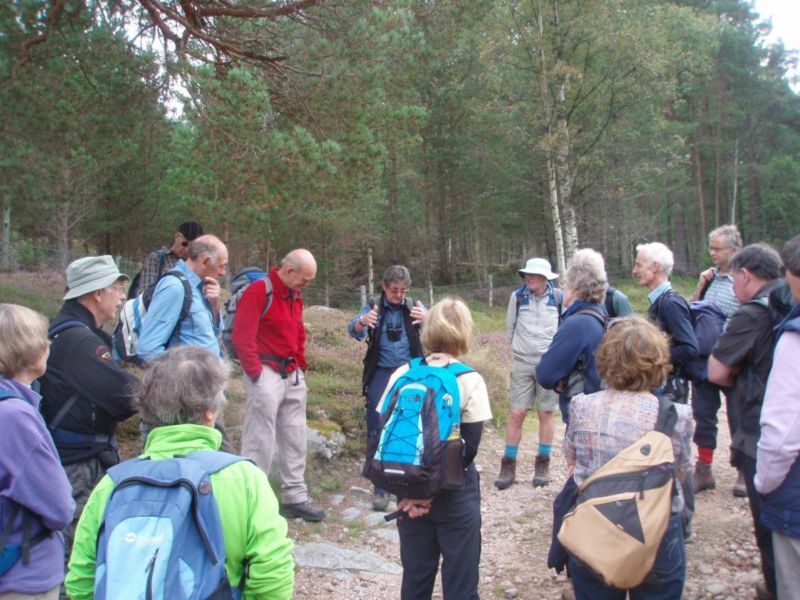 On Saturday 13th September, NEMT held a day out for members and friends at Glen Tanar. George Allan gave an introductory welcome and a soft sales pitch for new people to join NEMT. It has to be said that a number of people in the audience queried what the hard sales pitch would have sounded like! Head ranger, Eric gave a short introduction to the estate and its history. He explained the wide range of activities carried out on the estate to generate income for both the owner and to pay the wages of all those who work there. Things have moved on a lot since the foundation of the estate in Victorian times. Then he and his assistant, Mike, split the party into two groups and led them around the estate. We were extremely lucky with the weather. The sunlight coming through the old pines created some beautiful views, providing an appropriate backdrop as the rangers discussed the issues with conservation of both the old Caledonian pine forest and the creatures that live in it. Both groups managed to discuss a wide range of issues; from the impact of government subsidies to the effect of landowners own personal wishes and perspective. The issue of what constitutes natural quickly came up and, unsurprisingly, we were no further forward once we had finished! The subjects generated energy and I think that everybody felt them to be both interesting and of value. When we got back to the house, Colin, the wildlife manager, gave a short talk and then took questions. His perspective on deer management and predator control in relation to capercaillie was interesting. When we first thought of visiting Glen Tanar, we were attracted by some of their initiatives, such as photographing wild life instead of shooting it. The day confirmed our choice and gave a most interesting view of the dilemmas involved in both managing a modern estate and also in interacting with your neighbours when you have rather different objectives. Based on the people who I spoke to, a good day out was had by all!